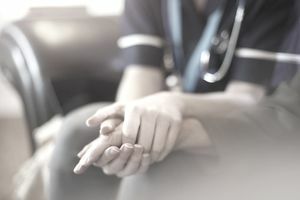 When somebody is diagnosed with a terminal illness and have less than 6 months to live, hospice care is often the treatment of choice but like any medical treatment, it’s expensive. Does Medicare cover hospice care and if it does, how much? Hospice care focuses on palliative care—keeping the patient comfortable. When a person enters hospice care, the treatment of the medical condition with the goal of curing or forcing into remission ends. The specially trained team of professions focus on providing physical, emotional, social, and spiritual support to the patient. The team of professionals may include doctors, nurses, counselors, social workers, speech and occupational therapists, aides, volunteers, and others depending on the patient’s needs. Hospice care can sometimes take place in a hospice facility but more often, care is given in the patient’s home and may also provide support to family or friends who are providing care. If you or a loved one is entering hospice care, you can rest easy knowing that Original Medicare pays for everything as long as your hospice care is in your home. Medicare hospice coverage may also include short-term respite care if a caregiver needs a break. You may receive hospice care at an inpatient hospice facility but the patient is responsible for room and board bills. The hospice doctor and your regular doctor must certify that you’re terminally ill—6 months or less to live. You accept care only for comfort—not for treatment of the condition. You sign a form accepting hospice care instead of more aggressive medical treatment. Medicare hospice coverage does not cover prescription drugs unless they’re prescribed to control symptoms or relieve pain. Also, be careful to not receive any hospice treatment from providers outside your covered hospice team. Once you choose a hospice provider, the only way to receive covered hospice services is from your chosen provider. Medicare will also not cover care you receive from an emergency room or ambulance transportation because the care focuses on treating the symptoms of the disease rather than the palliative care that hospice provides. What If You Have a Medicare Advantage Plan? Once your hospice care begins you don’t need your Medicare Advantage plan anymore because Original Medicare pays the entire cost of care. However, staying on your Part C plan allows you to continue receiving services not related to your terminal illness—eyeglasses, dental care, or other treatments, for example. Your normal Medicare premiums don’t change so you’ll continue paying your Part A (if you have one) or Part B premium. If you have a Medicare Advantage plan you will pay premiums through that plan unless you elect to drop the policy and pay only your Original Medicare costs. Also plan to pay no more than a $5 copay per prescription for any drugs prescribed to manage your pain and symptoms. If you elect to use inpatient respite care, you will pay 5 percent of the approved cost. If it costs $1,000 per day, you will also pay $50 of the daily cost. What If You Live Past 6 Months? Medicare will cover the cost of hospice care as long as you need it as long as your hospice doctor continues to recertify you as eligible for coverage. The first 2 benefit periods last for 90 days. After the initial 90-day periods, it stretches to 6-month benefit periods. After each of benefit periods, a doctor must recertify that you’re still eligible for hospice care. What about if you want to stop hospice care? You have the right to stop care any time you would like and fall back to normal Medicare coverage. Finding a hospice provider is easy. You could talk to your doctor or call your state hospice organization. If you can’t find contact information, call Medicare and they can help. You can also visit Hospice Compare—a site put together by Medicare to help you find the care you need in your area. If you’re under a Medicare Advantage Plan, you can call them and ask for help finding a provider.